Dr. Amborski and Dr. Pitcher use Image Guided Surgery to bring great accuracy and precision to your treatment. The number of appointments and time required, vary from patient to patient. Placement of dental implant can be completed under local anesthesia to numb the area, but can also be performed under nitrous oxide (laughing gas), or intravenous sedation. 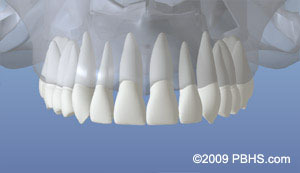 These options are discussed with you at your consultation appointment. When you are comfortable, the surgeon makes a small incision in the gum tissue to reveal the bone, creates space using special instruments, and gently inserts the titanium implant. After the surgery is complete, your surgeon may suture the gum to cover the implant or place a healing abutment which will be visible through the gumline. The length of time varies from person to person, depending upon the quality and quantity of bone. In some cases, implants may be restored immediately after they are placed. The surgeon will advise you on follow-up care and timing. After the initial phase of healing, the surgeon places an abutment (support post) or a healing cap onto the dental implant during a brief follow-up visit. 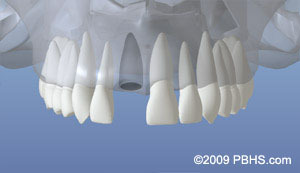 This allows gum tissue to mature and provides access to the implant. Implants are often placed several months after extraction. At times, an implant may be placed immediately after extraction of a tooth. This may involve a little more risk, but it simplifies the process—you won’t have to wait for another appointment to place the implant. When infection or other problems with the bone are present, immediate implant placement may not be the best treatment option.